Winter in Grand Canyon (with 2 full moonrises), Page (Upper Antelope Canyon with Full Moonset and Canyon X, plus Horseshoe Bend), and Sedona. 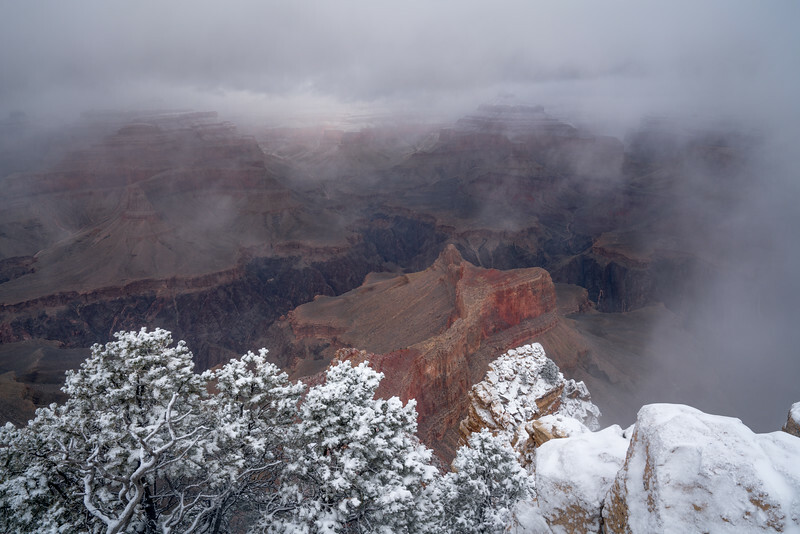 Join Don Smith and former Sports Illustrated staffer Ron Modra as we photograph the most exciting locations of Northern Arizona during the winter. We are positioned for an excellent chance of snow on the rim and no crowds! Moreover, I have positioned this workshop during the full moon cycle so we will have two moonrise shoots with a nearly full moon over the Canyon as sunset, and a full moonset over Horseshoe Bend at sunrise. The workshop will start in Tusayan, just outside the south entrance to Grand Canyon National Park's south rim. We will photograph my favorite locations. We are hoping for some fresh snow to work with along with the full moon. We will then caravan on to Page where we will photograph Antelope Canyon X! We will have this Canyon for 2.5 hours almost to ourselves. A sunrise shoot is also scheduled for Horseshoe Bend the next morning with a full moon hanging above the distant plateau. SLOT CANYON TOURS DISCLAIMER: Don Smith Photography LLC cannot be held responsible for weather cancellations. If Canyon tour is cancelled, you will be refunded that portion of the workshop. We will end the workshop in the red rock heaven of Sedona. This year I have timed the workshop to allow for a full sunset painting the iconic Cathedral Rocks with Oak Creek in the foreground. This will be an awesome photo opportunity you will not want to miss! NOTE: Due to the amount of shoots planned, there will only be (2) class meetings planned. Don't wait to sign-up as I expect this workshop to fill quickly. Only 12 spots are available! NOTE: Former 26-year Sports Illustrated staff Photographer Ron Modra will be assisting me on this workshop! We'll also find time in the middle of the day to improve your photography and workflow with image review and classroom training teaching you Don's workflow with Lightroom, Photoshop and selected third-party filters. This workshop will be based in three separate hotels. Also included in your workshop fee are four nights of private lodging with continental breakfasts in both Page and Sedona. Cost: $2095.00 - Includes (4) nights lodging and breakfasts (at Page and Sedona only), fees for two 2-hour photo tours at both Upper Antelope Canyon (timed for light shafts) and Canyon X. Price includes 4 nights lodging and continental breakfasts at both Page and Sedona. Additional nights can be added at a discounted rate. Lodging/Meals: The workshop will based at three different hotels. We will start in Tusayan (just minutes from the Grand Canyon's south rim). We will stay at The Red Feather Lodge for two nights. We will then caravan to Page where we will spend a night at the La Quinta Inn and Suites. Our final night will be spent at the gorgeous Best Western Plus Inn of Sedona. Transportation: We will carpool to shooting locations. Participants must find their own transportation to and from the workshop. Permits and Insurances: Don Smith Photography LLC is fully permitted for all location shoots and carries full-coverage insurance for all workshops.